Unlike a lot of other versions of drive windows hackers make (including my own previous HDD windows), I was able to get access to a clean room to work on this (courtesy of a very generous staff member at my univeristy). I used a sacrificial drive for the project which was a near identical drive that happened to damaged beyond repair but had a good enclosure. I started by taking the enclosure of the sacrifical drive and cutting it, which was a nightmare. I had done this before with a dremel, but this time the metal just didn’t want to cut right, so I ended up resorting to shears (the use of the old drive was merely a convenience, so if it didn’t work out I didn’t care). It turns out that a particular brand decided to start making their labels out of sheet metal covered with paper and stamping that metal onto the main enclosure, so it is twice as thick in the label area than anywhere else. I have no idea why they would do this instead of a normal label, but they did. In the end the shears worked with a lot of pounding out the deformities, and a couple of sharp edges to be filed. 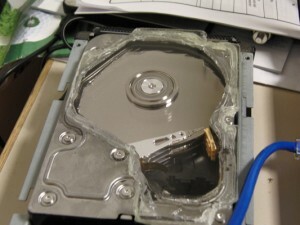 Results: I turned the drive on and tried to format it, but the drive started going berserk: the head was moving wildly, and the drive was unrecognizable as anything other than a storage device that could not be mounted. As it turns out, I did not properly torque the case screw that sits over the read/write head pivot point. A quick tweak fixed that, but nonetheless surprised how sensitive it was (only needed less than another 1/4 turn). The drive also has a couple of bad sectors according to the drive SMART data, but I expected that due to the relatively rough handling I had after the first problem.